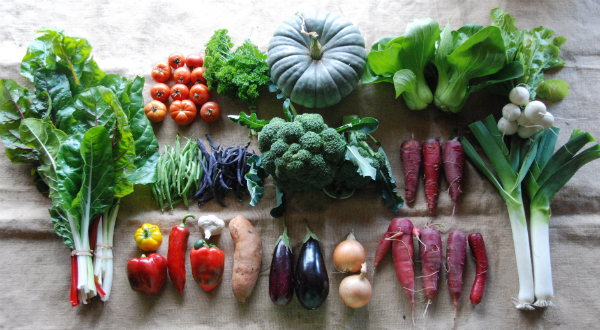 CSA AUTUMN SHARE WEEK #5 Autumn time is when we bring in the “storage” crops that have been growing all season, some for the past 9 months. It is a time of celebrating the season and being thankful that for the Spring and Summer tasks and weather that brought about this harvest of storage crops. All of the potatoes, onions, pumpkins and sweet potato have now been harvested in anticipation of a frost. Autumn is also when we sow the green manure crops which protect the soil through winter and then become the hummus that feeds the plants next season. Peter was able to sow large areas of the farm last week with many of the mandalas being hand sown. Perfect timing to take advantage of the rain we have had. NOTES ON WHAT'S GROWING In looking through photos of last season, this Autumn is very different. It has been colder and that coming behind a cooler, wetter summer has left many of the warm weather crops that were still thriving at this time last season already finished. We can only hope that the green manure crops have been planted with enough time, and warmth left in the soil to germinate and begin growing before the limited daylight hours of May, June and July arrive. The last sweet corn planting was not quite ready for harvest this week. the ears are not as grand as summer but we hope to include them in next weeks boxes. We have also had two broccoli plantings ripen at the same time. As they are the same variety, seeded three weeks apart and planted into soil prepared the same way, we are really unsure why. This means that you will receive extra broccoli this week, but possibly no broccoli in three weeks. The best laid plans are still completely subject to nature. Next weeks box should be good for stewing, with turnips, carrots, onions, rosemary and parsley. We hope to be able to start harvesting baby parsnips as well! There will also be mesclun! Farm pickup is 2-5pm Fridays and 8-11am Saturdays. Box pickup is available at other times by appointment only. RECIPE SUGGESTIONS Broccoli and Leek Soup - This recipe comes from a CSA member and last year work share volunteer Heidi Sze. She is a dietician and blogs at ‘Apples Under My Bed’ . As she is eating the seasonal veggies from the box each week, check her website for other great recipes. She also has some great photos of and thoughts about the farm throughout her blog posts - current and back as far as November 2013!! Creamy Pumpkin Soup Broccoli Fritters- In addition to the ingredients listed, this recipe lends itself to any left over capsicums, spring onions, herbs or spinach you may need to use up. Broccoli, Chicken and Cashew Stir Fry - This works well with onions, carrots, capsicum and bok choy too! Please note - Photo is a randomly selected full share box with the inclusion of a whole photo -The full shares received pieces of 2-3 kilos.